Home › Blog › Who's Ready To Polish? 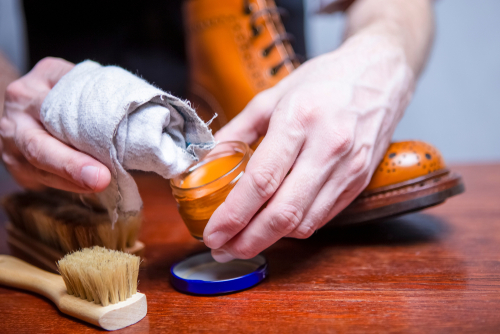 Are your leather shoes in need of good polish? The biggest one - it actually SAVES you money by extending the life of your shoes! 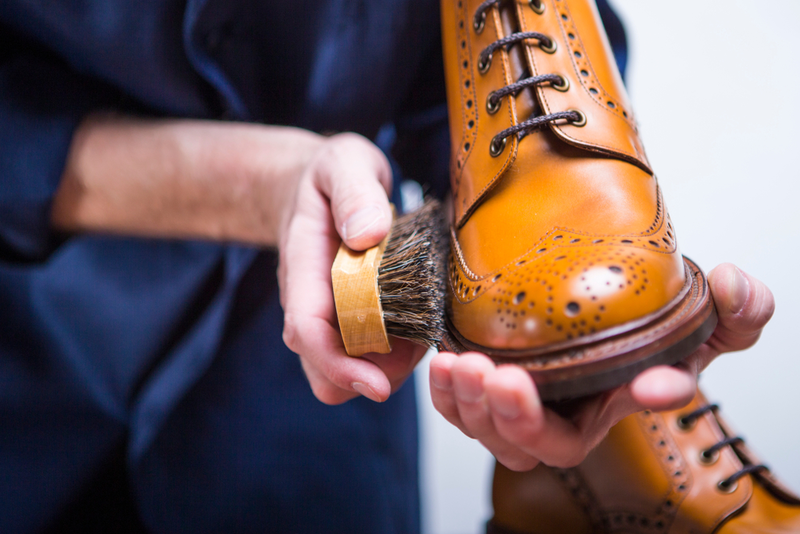 By polishing regularly, you are adding a slightly water-resistant coat to your shoe that helps keep your shoe free of oils, dirt, and other staining substances. The second reason would be representing yourself to the fullest. Who's going to take you seriously when your shoes look like they've recently survived a beating? 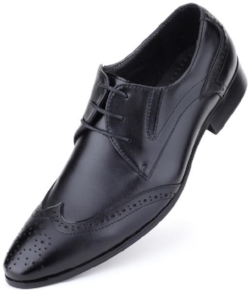 The rest of you is clean and prepared, so why not your shoes? Our third reason is mindfulness. While it only takes a few minutes to polish your shoes, take this time to appreciate your work and the effort you put forward everyday to be your best. 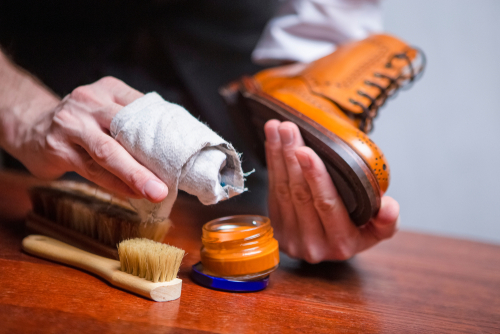 Now that you understand the benefits of polishing your shoes, let's get cracking! Step 1: Get yourself some materials! This list is quick, this list is short, this list can always vary a sort! Materials Needed: Stiff brush or damp cloth, polish/wax that matches your shoe color, a dry soft cloth or applicator sponge, and finally, a shoe brush! You could grab liquid polish for the soles and heel, but a light cleaning is usually good enough. Step 2: Clean your shoes! 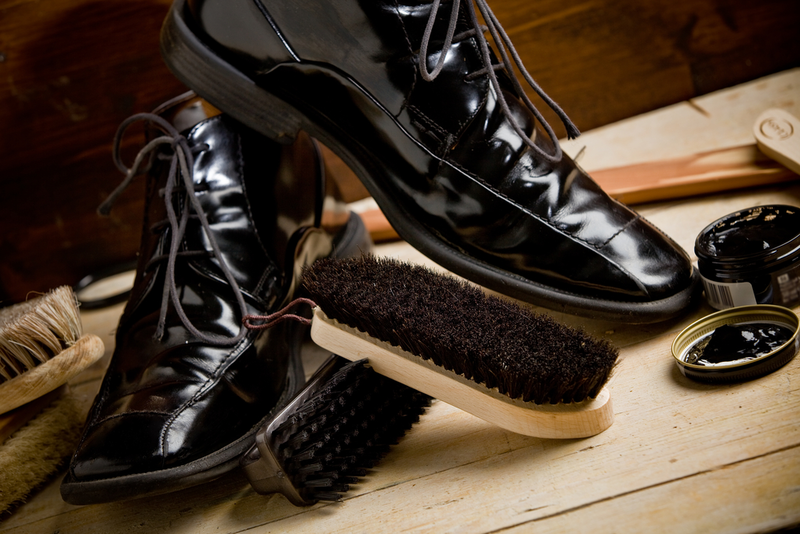 Using your stiff brush or damp cloth, briskly clean the leather and laces of your shoe of any dirt or loose debris. 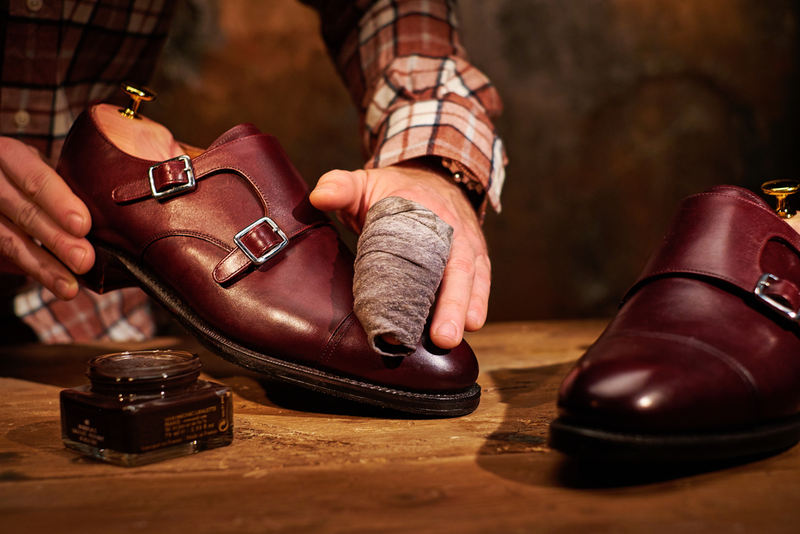 Doing so will help prevent you from scratching up the leather as you apply the polish. *If you used the damp cloth, dry your shoe before the next step! Step 3: Time to polish! If you don't have a sponge applicator with polish already on it, take your dry soft cloth and wrap it around it your fingers. Next you'll want to apply a small amount of polish, remember that a little bit goes a long way and you can always add more if you need. From there, begin to apply the polish to your shoe in small circles - if you have matching waxed laces, we recommend getting those as well. Wrap cloth around fingers as such - this will help prevent it from getting all over. Add a small amount to cloth. Remember that a small amount goes a long way. Apply in small circles, adding light force to help generate friction and shine. Step 4: Buff away the excess polish. Take the shoe brush and briskly buff away the excess polish from your shoe. 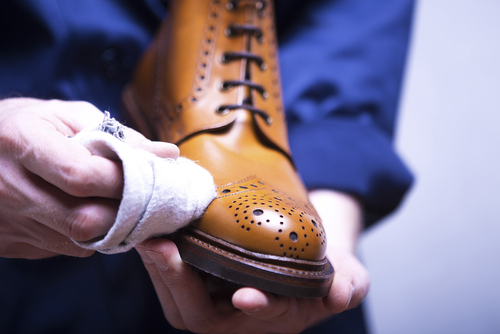 Not only are you removing the unneeded polish, the heat caused by the friction will help add a nice shine to your shoe. 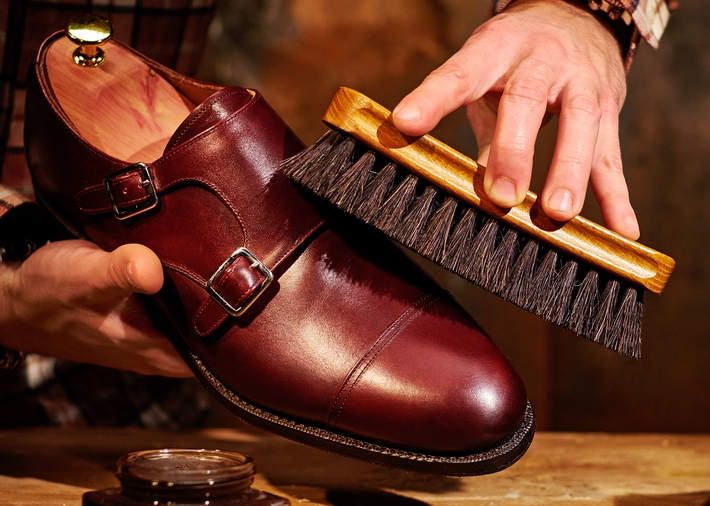 *A general tip for adding extra shine, without product, is to breathe on your shoes as if you're cleaning your glasses and then to briskly rub with the shoe brush. And that's it - you're done! 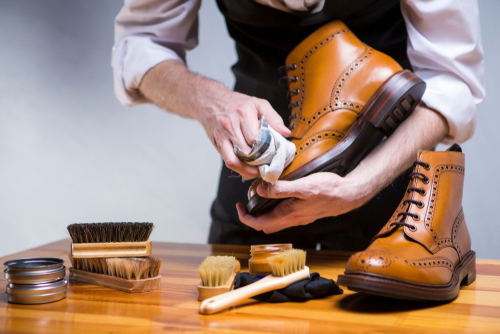 In less than 5 minutes you've perfectly polished your shoes and mastered yet another skill for the truly dapper! Are your shoes beyond repair? 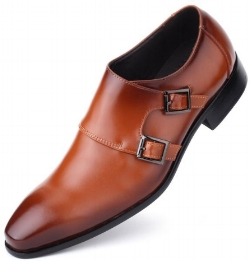 Shop with Mio Marino for a fine selection of genuine leather and man-made leather dress shoes - and so much more! 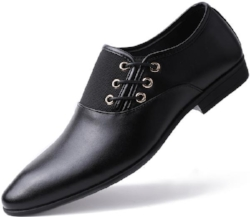 Made with genuine polished leather and soft insole. Breathable leather lining and 1" rubber sole. Crafted with top grain leather and moisture wicking lining. Follow us on the major socials! Did you enjoy our latest blog? Sign up for our rewards membership and share it with your friends for extra bonus points towards discounts and free merchandise!